I’ve long loved a good coat. 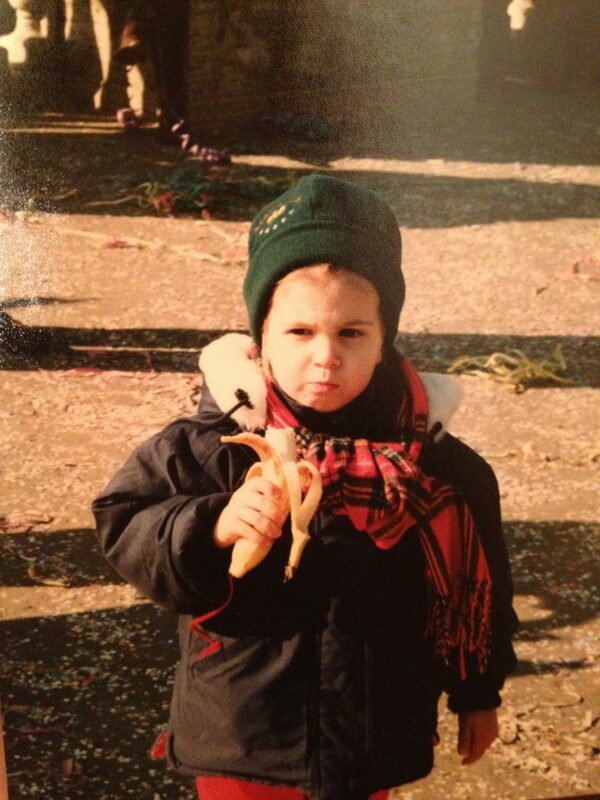 Evidence below; a young Elly, indisputably not enjoying the banana forced upon her by some pro-potassium adult, but very much dressed to the nines in an early rendition of 2019’s fascination with the cropped puffer. Note the McQueen-inspired tartan. Now nearly 25 and with a tendency for the third person when the situation calls for it, I still love a good coat. The coat in question doesn’t even have to be mine; in fact, most of the ones in my ever-growing entourage of outerwear are not. The majority come from my mom or my grandmothers. 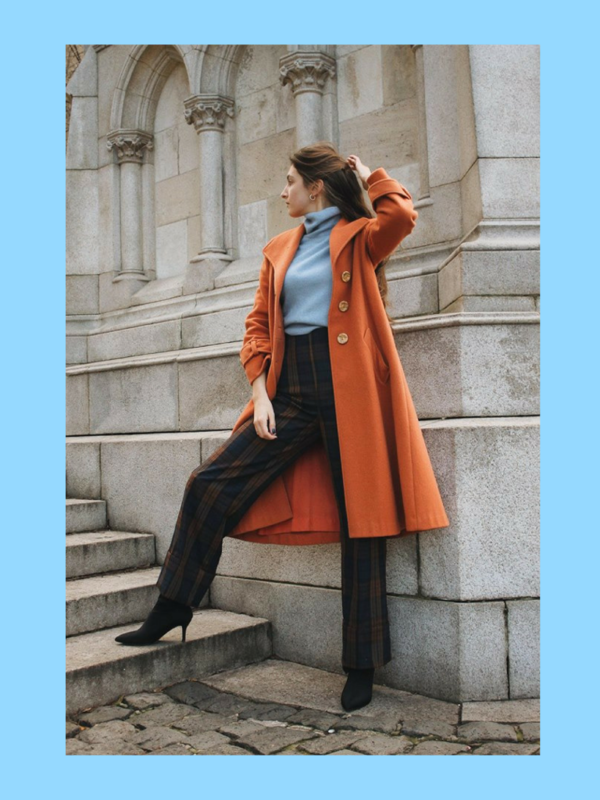 They are gorgeous wool coats in classic silhouettes and neutral hues, masculine trenches and cropped bomber jackets, and the odd colorful coat with 50s-era sleeves. I’m a huge believer in buying vintage instead of vintage-inspired—the real thing is always better, as I’m sure the stars of Botched will woefully agree—and giving family heirlooms a second wind through a new generation. I’m also a huge believer in the phrase “sharing is caring” when the outcome favors myself. 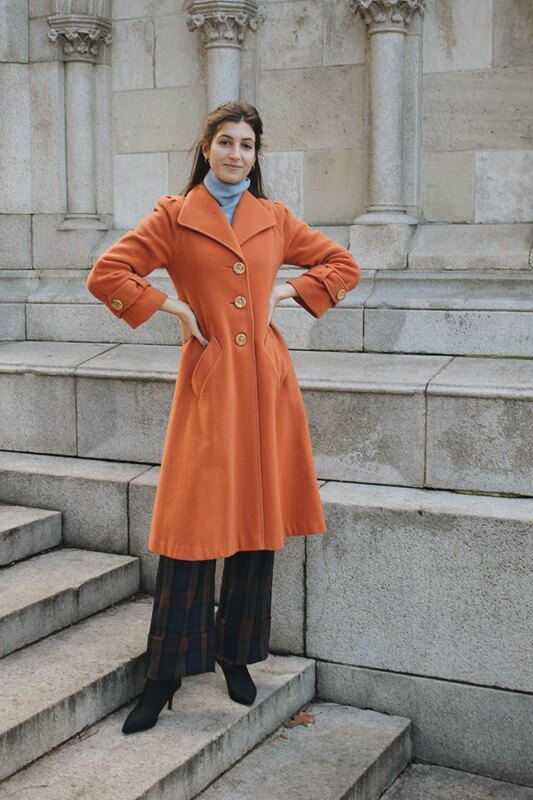 Such was the case with this vibrant orange coat, which belongs to my roommate Jenny and which she let me borrow for the purpose of this blog. Real friends will not only let you commandeer their outerwear; they’ll patiently sit in the freezing New York winter whilst you prance around Riverside Park, to help you document the whole thing. I’ve promised her my firstborn. The exciting thing about a colorful coat is that it lends itself to a slew of chromatic opportunities. 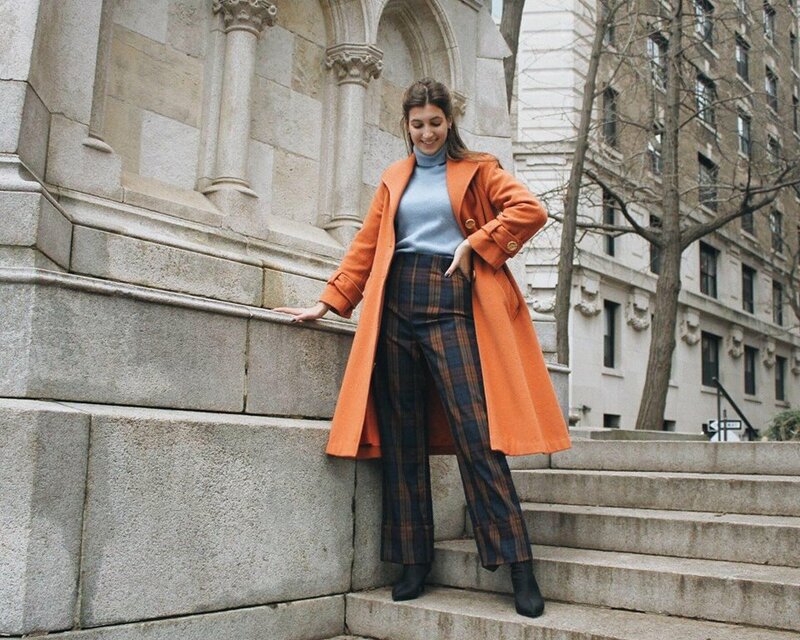 A brightly-hued coat is a statement piece with actual function (combatting frostbite) and can make even the dreariest of March days a little brighter. 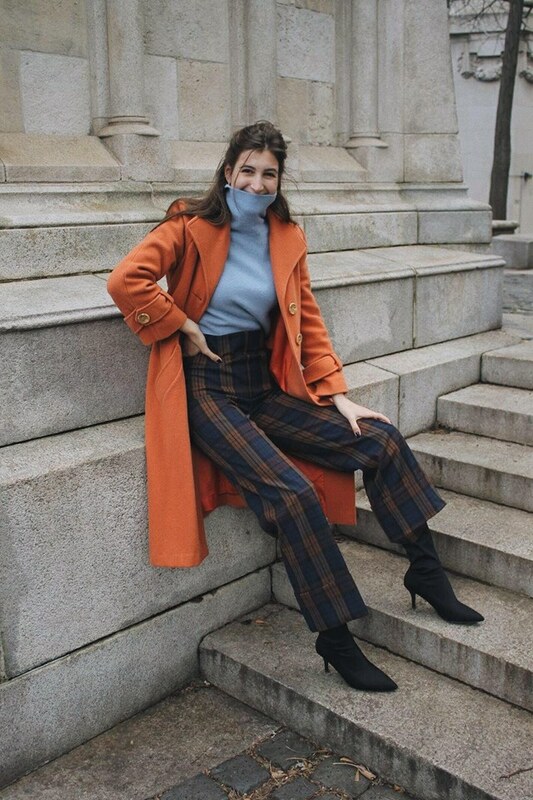 I’ve gone the color-blocking route, layering a cornflower blue turtleneck underneath and plaid pants I burgled from a geometry professor. I’d always hated dressing in the winter because it favors function over fashion. It’s often an exercise in weather-repelling more than it is creative expression; but maybe this is because while I love my coats, I had previously been using them as a necessary afterthought, rather than as the impetus for an outfit. 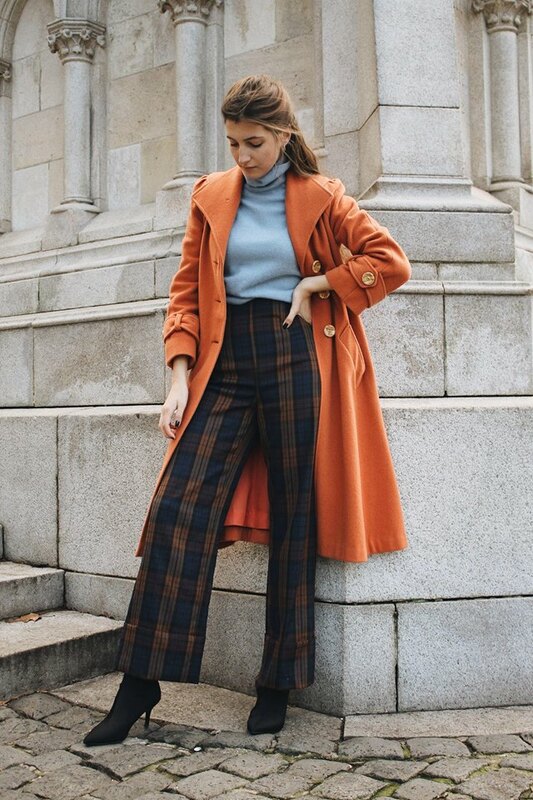 Maybe making winter dressing more exciting is as easy as making coats the puzzle—thinking of creative ways to complement them and make them the focal point. 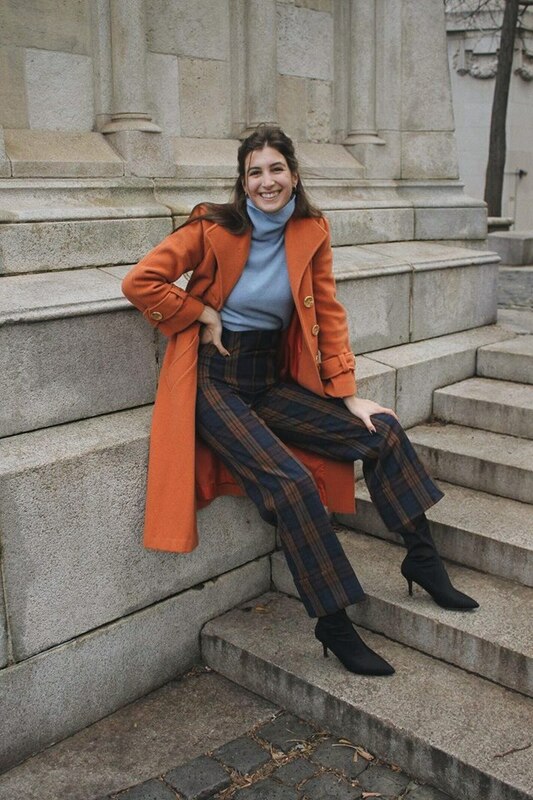 Playing up the retro A-line silhouette of an old peacoat with equally retro peg trousers, kitten heels, and soft leather gloves, for example, or building a color story from the color of the jacket. 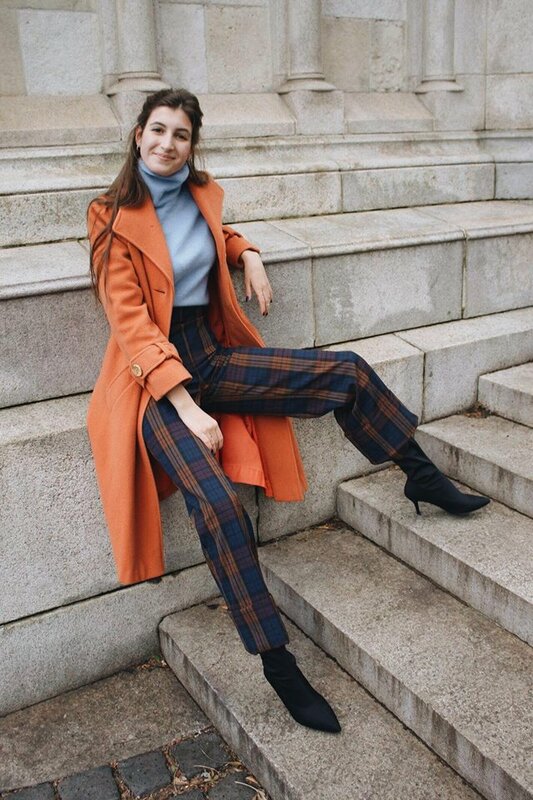 Whatever the case, I’m almost sad winter is coming to a close and pieces like this orange coat are about to go into hibernation. But then I remember things like strappy sandals and open windows and the silence of my old apartment’s demonic heaters, and that sadness instantly evaporates. Spring, where you at?